Okay...I know that Halloween is over and you may be anxious to put it behind you. 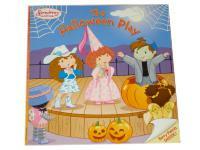 Yet, the book I have chosen for this theme is called The Halloween Play. If you are thinking of presenting a play with your own group, reading this story will give children an idea of how fun, exciting, and challenging the task may be. Strawberry Shortcake and her friends go about creating their own costumes, learning their parts, and preparing the décor. However, the friends are faced with a disagreement which causes the group to divide. Luckily, just in time, the friends find a way to work together to make their play a success. This book is a great example for children. It demonstrates how considering everyone's ideas really is the best way to have fun! Before you sit down with your group to decide what your play will be about, it may be a good idea to read this story and discuss it. Jot down any suggestions children in your group may have and then, together, try to make connections between the roles and themes to make your play the "berry" best play ever!